Investing in a listed property can be a hugely rewarding experience. For those who relish the idea of period features and a home rich in heritage, then the opportunity to live in and preserve an unusual property such as a converted mill, chapel, school or windmill, could make the ideal home life. However, these period gems don’t come without responsibility. In this post, we’ll examine the ins and outs of buying a listed property to help you decide whether a building rich in culture but high in care and maintenance really is right for you. A listed building is one that has been put on the national register because it is regarded as a property of architectural or historic importance. 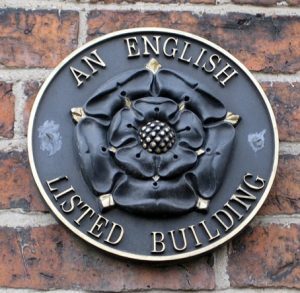 In any case, the actual ‘listing’ refers to the whole building and its grounds, rather than, as is often believed, just certain period features. You don’t really have to worry about buying a listed property without knowing, as properties will typically be detailed as such during the sale (and can cost significantly more!). However, it is possible to check if a house is listed on the National Heritage List. One of the biggest headaches for people buying a listed building is determining whether the previous owner has carried out any unauthorised work on the property. The reason that it’s so important to identify this before a sale is that regardless of who made the changes to the property, liability falls to its current owner. In other words, should a listed building be discovered to have unauthorised additions or renovation work completed on it, the responsibility to correct these falls to whoever the owner is at the time. If you’re buying a listed property, it’s advisable to have a more in-depth survey carried out on the property beforehand. These surveys are usually known as ‘full structural surveys’. The reason for this more detailed examination is that particularly old properties or those of non-standard construction are more likely to have hidden defects and/or these can be much harder to identify. Also, given that you’re likely to be paying more money for a listed property, trying to save on the survey process would be a false economy. You should never buy a listen building with the intension of extending or renovating it. Although it may be possible to make certain changes about the place, such as refitting a kitchen or bathroom, or changing some of the internal layout, this is by no means guaranteed. Once you buy the house, you will be assigned a ‘conservation officer’ from the local council, who is authorised to make all decisions relating to your property. What mortgages options are there for a listed property? Generally you’ll find that the more usual the building, the more difficult it is to get a mortgage. This means that it can sometimes be tough to get a mortgage for a listed property, particularly since lending criteria tightened up post the economic crisis. However, that’s not to say that you won’t find some lenders that are willing to help (in particular smaller building societies), although mortgages for unusual properties does tend to come with a premium. If you’re set on buying a listed property but are struggling to find a willing lender, then it’s advisable to speak to a broker, who will be able to scour the market to find a deal to suit you. Do I need special insurance for a listed property? In a nutshell, yes. The reason for this is that should disaster strike, results in you needing to make a claim for refurbishment or repairs, you will need to use similar materials as the rest of the house in order to conserve its authenticity. Naturally, these are likely to be either specialist and/or costly, and the chances are that a standard insurance policy won’t cover the full cost. If you do find an insurer to affordably provide cover for your listed home, then you may find that there are a number of extra ‘hoops’ to jump through. The likelihood is that you will need to provide the details of your buildings survey to the insurer so that they can be confident that all previous work has been carried out professionally and that the property is what you say it is. For some, investing in a listed property is a dream come true. However, these unusual dwellings can be hard work to keep in tip top shape. It’s advisable to exercise due caution at every stage of the buying process — from enlisting a reputable buildings surveyor to selecting the right mortgage — to save yourself a great deal of hassle later down the line.